Sean Spoelstra, pastor of Encounter Church, a Grace Brethren congregation in Dublin, Ohio, has announced that the church is launching its first church plant. 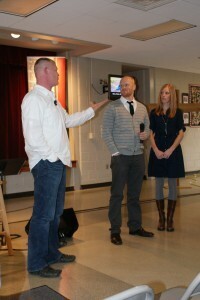 “For more than three years I’ve said, ‘I don’t know who or where or when, but we are committed to planting a church and are putting five percent of our offerings aside to prepare for it,'” Spoelstra recalled on January 29 as he introduced Mark and Kristin Artrip as the couple who will be the first to lead a church plant out of Encounter Church. The announcement came as Encounter celebrated its third anniversary of holding Sunday morning services and Spoelstra was teaching on the church’s core value “Multiply,” which has church planting as a major component. The Artrips will move to Hilliard, Ohio, on the northwest side of metropolitan Columbus, to begin a new Grace Brethren work. Mark is currently the youth pastor at Grace Church in Powell, Ohio.